Rachel and Adam are sent from their New York home to stay with their grandmother, following their parents’ bitter divorce. But the quiet English village where their mother was born is a sinister and unsettling place. Is there a genuinely dark heart beating beneath the thatched roofs of the picturesque village of Triskellion? Categories: England, Fantasy, Paranormal, Thriller | Tags: Will Peterson | Permalink. The Bartimaeus Books by Jonathan Stroud. I love these for a number of reasons, but mainly for Bartimaeus himself; he’s a sassy, jaded, arrogant gargoyle determined to come out on top. I also loved Bart’s pairing up with Nathaniel – who is an equal jerk, just a different kind. Action, humour and pathos all rolled into one. Can’t wait for the fifth. 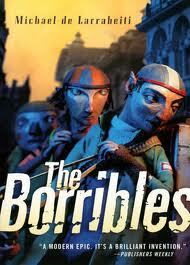 The Borribles, by Michael de Larrabeiti. This book has a bit of a cult following. In this world, disaffected young adults drop out of society, grow pointed ears and live in tribes across London. It’s quite dark and bloody but, at the same time, quite Tolkienesque; the Borribles have a rich history and an incredibly-defined culture of their own. Plus there are the bad guys, the Rumbles’ giant rat-like creatures that want to see all Borribles destroyed. Plus it’s the first book I read to features the word ‘arse’. Young Sherlock Holmes Black Ice, by Andrew Lane. I’d always loved Conan Doyle’s creation, but it was interesting to see just how Lane has humanised the young Sherlock and hints at how he will become the distant detective of the future. Although they are packed with intrigue, mystery and detail, they are easy to read. 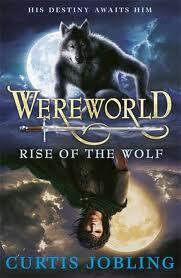 Wereworld, Rise of the Wolf, by Curtis Jobling. If I’m honest, I was prepared not to like this. I love my werewolves, but I think I’m a bit of a traditionalist and see them as lone, tormented creatures. Jobling has created a world where were-creatures are part of society and, to my surprise, I loved it! 16 year-old Drew is a great character, fraught with the worries that come with that age, which made it all the more interesting to read. Ash Mistry and the Savage Fortress, by Sarwat Chadda. What I loved about this book was the way Chadda has created a world of his own from Indian myths and legends and dropped a 21st Century geek, slap-bang in the middle of it. Ash isn’t your typical hero, but then this isn’t your typical YA book. Great stuff. 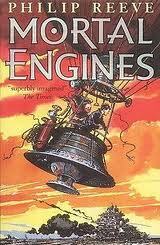 The Mortal Engines books, by Philip Reeves. These books are almost too big to be contained by pages. I don’t mean that they’re long, but the scale of Reeves’ vision is epic. And the characters are beautifully flawed, some of them wearing their scars as testament to their fallibility. It’s Steampunk at its best, because the ‘s world he’s created doesn’t overshadow the characters, but you’re always aware that it’s there. The Suicide Club, by Rhys Thomas. 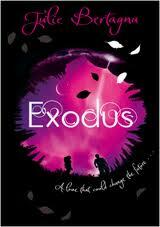 Like the title suggests, this is a dark book – but only in as much as it explores the darker side of the teenage psyche. It’s also about love, friendship and betrayal and is an utterly absorbing read. I really enjoyed it. Exodus, by Julie Bertagna. Set in an alternative reality, where Earth has flooded, this is a great novel about betrayal on a personal and a global scale. The sequel, Zenith, is just as action-packed and engaging. The unsettling aspect of this book is not only the potential for the world to end up underwater, but the way that the remaining societies organise themselves. The three survivors, Mara, Tuck and Fox are superbly engaging. The Black Book of Secrets, by FE Higgins. 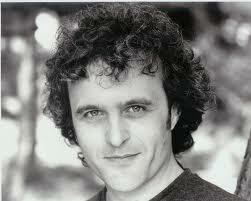 It’s a brilliant conceit, brilliantly executed: Joe Zabbidou buys people’s secrets and he’s looking for an apprentice. Enter Ludlow Fitch, the hero of the piece. I loved the idea, the writing and pretty much everything about this book. I have read it several times and don’t get tired of it. 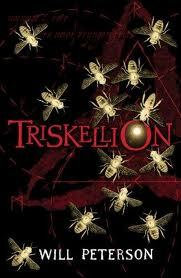 Triskellion, by Will Peterson. I liked this book because of its simplicity. Yes, there are plenty of twists and turns but, at its heart, it’s a Good vs Evil kind of ride. It’s set in a quiet, English village where two American kids, Rachel and Adam, sent to stay with their grandmother. And, of course, everything is not what it seems… The great thing is that the author doesn’t dumb-down; I think may writers underestimate Young Adults but, if you think back, you were easily capable of pretty sophisticated thoughts and feelings. And, nostalgically, this book reminds me of episodes of Classic Dr Who, where everything was a slow-burner, capped of with a cracking reveal. Categories: Top Tens | Tags: Andrew Lane, Andy Robb, Curtis Jobling, FE Higgins, Jonathan Stroud, Julie Bertagna, Michael de Larrabeiti, Philip Reeves, Rhys Thomas, Sarwat Chadda, Will Peterson | Permalink.